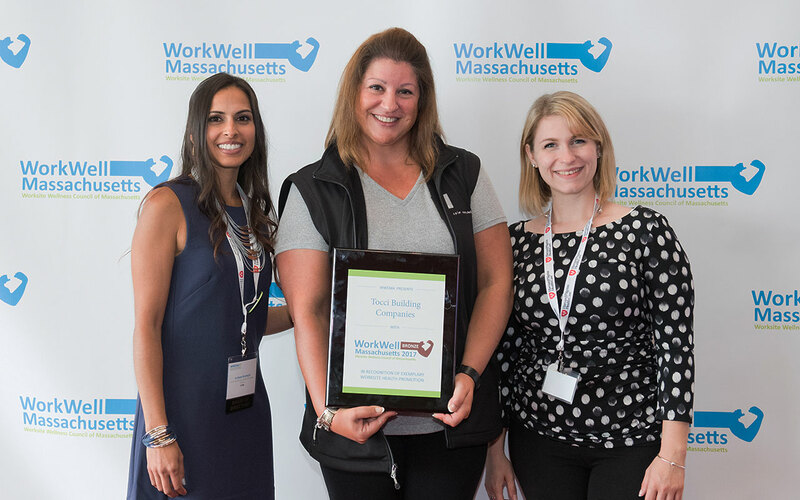 WOBURN, MA (September, 2017) – Tocci Building Corporation (Tocci), a Boston-area construction management company and recognized leader in advanced construction process, is proud to be a WorkWell Massachusetts Award Program Bronze Level winner for exemplary worksite health promotion. The award recognizes Tocci Building Corporation’s achievements developing, implementing, and participating in corporate health improvement and wellness programs. This is Tocci’s second consecutive year receiving this award. Tocci is one out of three Bronze Level award recipients for 2017. Tocci’s commitment to health and wellness is exemplified through a variety of company initiatives, such as an on-site fitness center, mobile dentistry and vision testing, group yoga sessions, jobsite safety lunch and learns, and fun companywide wellness challenges. Tocci also offers a BerkBox in its employee café, which provides healthy snack and lunch options. Employees tend to a company garden through the summer months, and also partake in a local CSA share. Homemade and healthy snacks are made for employees weekly. The team also organizes an annual Fitbit challenge and collectively took 36,000,000 steps in 2016. 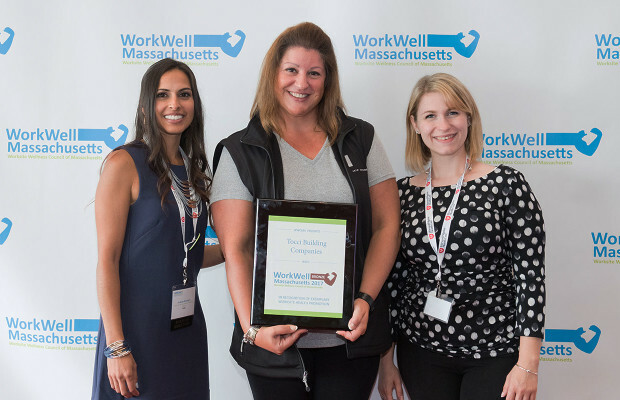 WorkWell Massachusetts is a corporate award program created by the Worksite Wellness Council of Massachusetts (WWCMA) – a not-for-profit member organization dedicated to the advancement of worksite wellness programs. The award program’s criteria are based on the HERO Employee Health Management Best Practices Scorecard, in collaboration with Mercer, a tool designed to help organizations learn about best practices, discover opportunities to improve their programs, and measure progress over time. Applicants are required to provide details on their strategic planning and organizational support, program design and implementation, participant engagement, and measurements and evaluation, and applications were reviewed and designated by a WWCMA appointed committee of industry professionals. Information on WWCMA and the award program can be found at wwcma.org. The Worksite Wellness Council of Massachusetts (WWCMA) is the preeminent, independent, and objective resource for health promotion in the workplace. A 501c3 not-for-profit member organization, WWCMA champions wellness programs that help employers encourage healthy employees, healthy families, and healthy communities across the Commonwealth. The council offers innovative wellness best practice programs, training, and events along with insightful resources and tools to help educate and advance Massachusetts organizations and their corporate wellness teams. Visit them at wwcma.org and follow them @WorkWellMass. Tocci Building Corporation, a leading construction and project management firm, provides highly sustainable building solutions with an emphasis on lean construction. The firm specializes in advanced technology, and Highly Collaborative Project Delivery (HCPDSM) Headquartered in Woburn (suburban Boston) MA Tocci builds throughout the Northeastern US and provides consulting services to leading Owners across the country. For more information visit www.tocci.com.